Now if you have the hope of becoming a Doctor, then it is necessary to bring a good result in 12 Science B group also NEET exam. The MBBS process in India is a bit complicated compared to other countries and the colleges of Universities are recognized only with limited seats. At that time, doing MBBS in India becomes a bit difficult. If we want to MBBS in the right place yash overseas have a good alternative (options) to other countries except India. Other MBBS options in other countries except India. If you want to do MBBS in Ukraine, China, Russia, Philippine, Kyrgyzstan and Georgia, welcome to Yash Overseas we will give full guidance to you. All of the countries given above can easily provide complete guidance because of yash overseas directly contact with Medical universities and colleges last 12 years. The Medical Colleges of all these countries have long been in contact and many students from India have done MBBS by yash overseas. Yash overseas get admission only in the same colleges of the given countries, which are recognized by the Medical Council of India (MCI) and the World Health Organization (WHO). Which of our countries is affiliated with the University and Colleges? To get information and to contact us, click on the link given below. You will get complete information on MBBS after visiting the website. 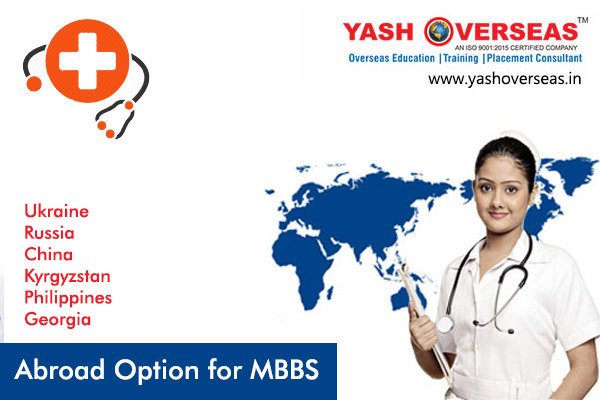 If you want to MBBS from Abroad then Yash overseas can help in getting admission in Ukraine, Philippines, China, Russia, Kyrgyzstan and Georgia abroad. Yash overseas have got accreditation of admission for MBBS in the Universities given below in Ukraine. Yash overseas have got accreditation of admission for MBBS in the Universities given below in Russia, Kyrgyzstan, China, Philippines and Georgia. If you wish to do MBBS Abroad, you can easily contact us; our office is also in India and abroad. For information for abroad MBBS click on the link given below.